Stunning curves meet full-immersion bathing in the Soho 5.67 ft. Centre Drain Soaking Tub in White. Included drain allows for quick and easy drainage. Acrylic construction is strong, light and warmer to the touch than typical enamel and steel tubs. Deeper than your standard tub with a chic rounded look, the Mermaid 5 ft. Centre Drain Soaking Tub in White is a superb choice for smaller bathrooms or confined spaces. Contemporary styling and soft lines contribute to the freestanding bathtub's modern aesthetic, sure to enrich your bathroom ambience and add a hint of serenity. This unit includes a floor-mounted single-handled chrome faucet along with chrome-finished overflow and drain outlets for a polished look. The acrylic construction is strong, light and warmer to the touch than typical steel or enamel tubs, allowing for easy installs and heat-retaining soaks. Soho 68-inch Acrylic Flat-bottom Centre Drain Soaking Tub in White Stunning curves meet full-immersion bathing in the Soho 5.67 ft. Centre Drain Soaking Tub in White. Included drain allows for quick and easy drainage. Acrylic construction is strong, light and warmer to the touch than typical enamel and steel tubs. 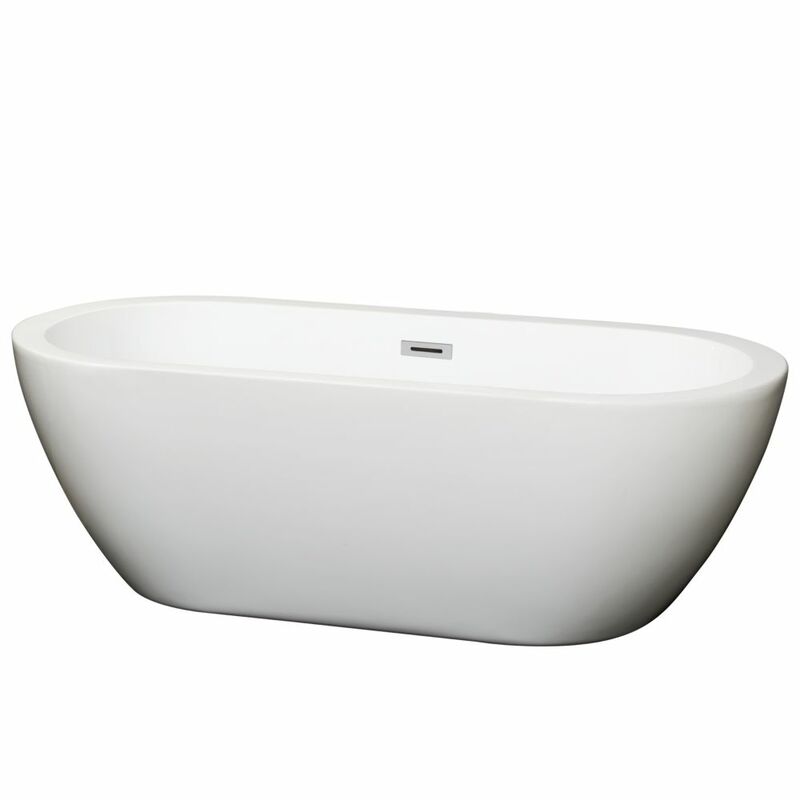 Soho 68-inch Acrylic Flat-bottom Centre Drain Soaking Tub in White is rated 4.0 out of 5 by 8. Rated 5 out of 5 by LLP from After looking at tubs everywhere, from online to plumbing supply... After looking at tubs everywhere, from online to plumbing supply stores to remodeling centers, we decided on this one because it had an attractive, curved but simplistic shape, and it had a wide edge. When getting in or out of a tub with a narrow edge, it didn't feel substantial enough or easy to grasp. This tub is light weight, but it doesn't look it. We are very happy with our purchase, and the cost was very reasonable. Rated 5 out of 5 by AZEngineer from This is the second of these tubs we've used. They are a tremendous value in a one piece acrylic ... This is the second of these tubs we've used. They are a tremendous value in a one piece acrylic tub. At this price point all others are two piece where you get an ugly seam. The tub comes with super clear instructions as well. We bought the first tub 4 years ago from another online seller and it shipped in a sturdy carton. This one we purchased from home depot and it arrived in a very flimsy box on a pallet. I was not able to handle the pallet so we had home depot remove the box from the pallet and the box is so flimsy the tub nearly fell through the box as we lifted it out of the pickup. Rated 3 out of 5 by SuperSoaker from Was easy to install, looks great, and deserves 5 stars. BUT the overflow and drain came installed... Was easy to install, looks great, and deserves 5 stars. BUT the overflow and drain came installed and is nicely hidden, yet cable driven plug only lasted 6 months before failing. Now I have to see how customer service is since there are not many options for replacement parts and no instructions online anywhere. Rated 1 out of 5 by Craboo from ONLY MADE FOR WOOD FLOORS We were installing the tub from a new rough drain in a concrete floor. These tubs are according to Wyndham Collection are only made for "standard installation" which according to them means on a wood floor on the second floor of a house or with a crawl space underneath. They then said we could make it work if we order a $300 drain online from a Canadian company. Please read other reviews even the positive ones they were cutting drywall out of a kitchen ceiling and that was a "standard installation" . I got rid of the useless instructions that label the same part with two different names on the diagram and in the writing and made it work. In the future I will use any product other then Wyndham Collection. Very poor design, talk to your installer before purchasing. Rated 5 out of 5 by Remodel from It really updates my bathroom The tub is easy to carry into the house, 2 people can easily handle it. We had a plumber install, he said it was not hard to complete. He put weights in the tub while the sealer was drying. We have a large crawl space under the bathroom, this made the install much easier. Love the look of the tub, perfect size and the depth is great. Rated 5 out of 5 by kc347 from Love everything about this tub - Did have to cut hole in ceiling below for access! We love this tub and are very happy with it however installation is a pain. Our floor is not completely level and even though we dropped the feet all the way at the back the front still has a decent gap at the bottom of the tub. It does not sit flat with the floor. It means the front can not be siliconed all the way around. I believe I saw another review where the person said the same thing. It can be tricky to get it completely level with the floor. In order to connect the drain pipe under the tub we had to cut an access panel in our kitchen ceiling. Luckily our sheet rock is not the best in our kitchen and my husband did not flip out about it but it was not expected. We ended putting a ac grate/cover over the hole so we did not have to patch the sheet rock and can access the drain easily in the future if ever needed. The size is perfect and it is big enough for a normal sized adult but not too big that it takes up a lot of space. I am 5' 8'' and I can practically lay with my legs straight if I slide my back down the side and rest my head on the ledge. My husband is 6' 5'' and he can sit with his legs straight out (which a huge deal at that tall). I can fit all 3 kids in at a time but it is a little snug (3, 5 7 yrs). It is not very wide so I don't think you would put 2 adults in it. In all, we LOVE the tub but the install is a bit of a pain. My plumber and father were able to do it together. Rated 3 out of 5 by ml8880 from soho beautiful tub, seems to be of very good quality. awkward installation of drain. Could be a lot easier to install if they redesigned the drain mechanism. Rated 5 out of 5 by MJS3 from The "stand out" in the room. This fantastic tub is the focal point of my newly re-modeled bathroom. The shape is sublime!